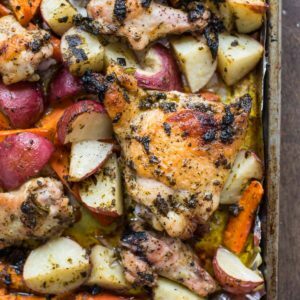 Need a light but satisfying meal to use up all that fresh spring produce? 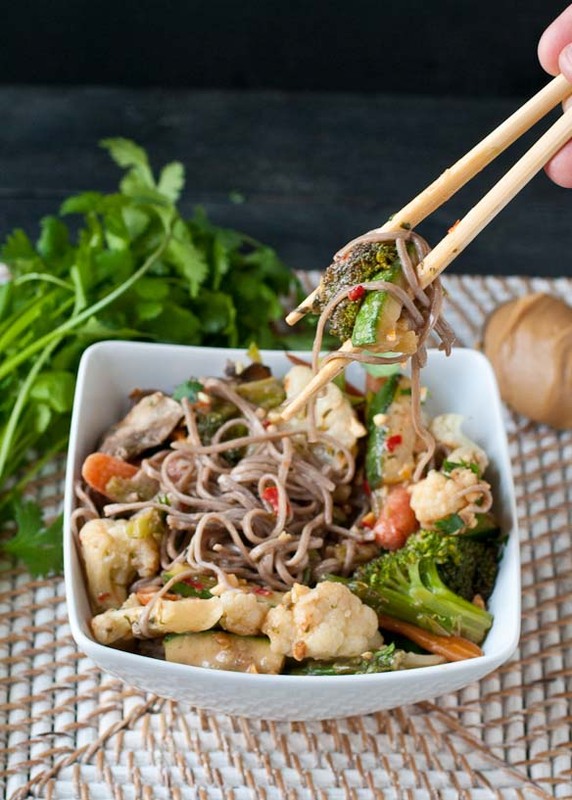 This Vegetarian Udon Noodle Bowl with Spicy Peanut Sauce will be your new best friend! Do any of you have spaces in your house that are totally neglected? The junk drawer, that one hall closet, the creepy dungeon basement. For me, that space is our guest room. We technically have two spare rooms in the house and no kids at this point, so our guest room gets very little use. It’s more of a storage/catch-all/shut the door when people are over kind of space. And truthfully, I only clean it when we have friends visiting from out of town. With the recent bedroom reno, we had to do a lot of organizing, cleaning out, and moving around in our upstairs rooms, including the guest room. Friends, it is mildly horrifying how much junk, dust bunnies, clumps of dog hair, and piles of “to file” papers can collect in a room you don’t even use. I mean, how did this stuff get here? It’s like the dust decided since we weren’t using it, they would just colonize the place. Pretty sure they’ve already elected officials, established an army, started a cold war with the vacuum, and become a tourist spot for retired dog hairs. I feel like there must be some way to harness the power of dust and turn it into something positive. I mean, can’t someone figure out how to make neglected space generate sprinkles instead of dust? Or how about I leave a room alone for a day and when I come home it’s made dinner for me. Somebody make it happen. Pretty sure a Nobel Prize is on the line for this one, so get on it people! While the smarty pants are working on figuring that out, I’ll be making noodle bowls. Pretty much every night. Because seriously guys? I can’t get enough. 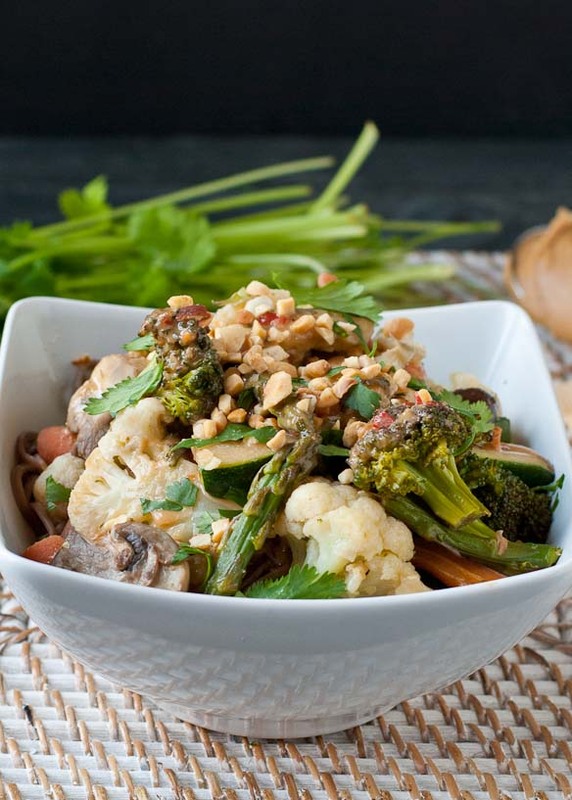 This Vegetarian Noodle Bowl with Spicy Peanut Sauce is particularly awesome. It’s filling but light, flavorful without being heavy. 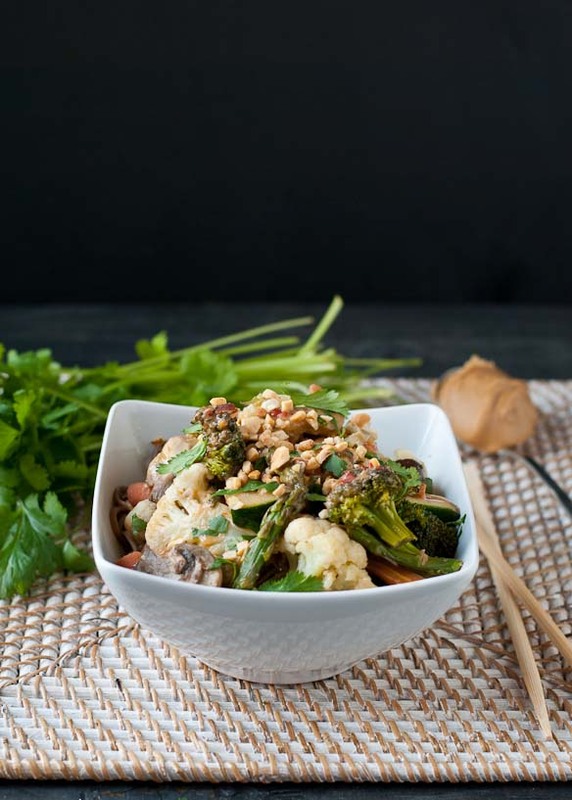 The veggies are simply sautéed in sesame oil then served over udon noodles with a spicy, tangy, creamy, peanut butter sauce. About the sauce. I’ve made it a few times. Each time, I’ve tried to cut out a few of the ingredients to make it simpler. Each time I end up adding all of the ingredients. Here’s the thing. If you don’t have fish sauce or sesame oil, that’s okay. The sauce will still taste good without it. But those last two things just add so much depth to the sauce, it’s really worth it to take the time to throw them in if you’ve got them. And don’t let all the ingredients scare you off. You can find them all in the Asian section of your grocery store. And the recipe itself is as easy as dump and whisk. Feel free to adapt this to suit your mood or the ingredients you have on hand. It’s equally good with buckwheat noodles and can be made gluten free with rice noodles. I’ve made it with bell peppers and snap peas instead of broccoli and cauliflower, all with great success. And of course, you can add some shredded chicken or grilled steak for the meat lovers in your life. Go ahead and experiment and see what you come up with! Maybe yours will be as awesome as a machine that turns dust into sprinkles. (But probably not). Chop the broccoli and cauliflower into florets then chop the remaining vegetables into bite sized pieces. Heat the sesame oil in a large skillet over medium high heat. Once the oil is hot, add the broccoli and cauliflower. Saute for about 2 minutes then add the asparagus and mushrooms. Turn heat down to medium low, cover and cook for 5-7 minutes or until broccoli is nearly tender. Add the zucchini and saute for an additional 1-2 minutes or until softened. Sprinkle with salt and pepper. Meanwhile, cook the udon noodles according to package directions and make the sauce. 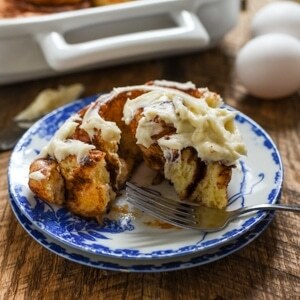 For the sauce, place all the ingredients in a medium bowl and whisk together until smooth. 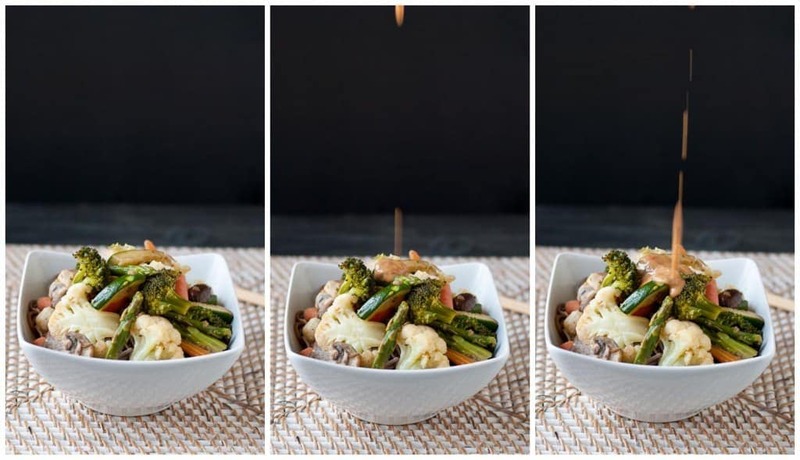 To serve, toss noodles with the vegetables in individual bowls then pour sauce on top. Garnish with cilantro and chopped peanuts, if desired. This is gorgeous! I would love a huge bowl of this! Thanks! Wish I could send you one! Dust into sprinkles. I am working on THAT! This dish looks great! I love that the sauce combines sriracha and peanut butter…yum! Hahaha, my guest room and office are like that lol. We clean up the guest room before my niece gets there when she stays with us LOL. Love this noodle bowl! I bet it’s freaking awesome! I am guilty as charged. Our spare bedroom has a sister colony of dust to match yours. What makes it worse is that I end up shutting the door to make it all go away and then forget what’s growing/breeding in there. I think I need a few of your noodle bowls as I ponder what to do if I ever decide to take on that room. They look fantastic. I don’t even want to talk about how much junk I have crammed into my 1 bedroom apartment. It’s insane. The only thing that keeps cleaned out on a regular basis is the fridge! Ha! Guess we will drown our sorrows in this noodle bowl. Ha, ours is our exercise room. We finally went in there and started to tackle it. It was a mess. I love this recipe so much. And the photos of you pouring the sauce were great.